High-volume efficient fulfillment | CommentSold Help Center! An overview of fulfillment methods used by businesses doing thousands of orders per day! It's inevitable. You are growing your boutique, you start hiring people, and all the sudden, you start getting fulfillment errors. Wrong item sent to a customer, order mark fulfilled but never shipped, shipped the same item twice to a customer, etc. All of these issues are compounding issues. Imagine that Suzy orders a medium, but instead is sent a small. Now Suzy is angry because she got the wrong size and it doesn't fit - but now the small that you already sold to someone else is halfway a cross the US and you have to refund the person who ordered a small. We designed a system to combat all of these issues! We are going to show you the method used by boutiques that process over 1,000 orders/day. You do not have to implement all of these steps, but I promise that it is one of the most efficient and cost-effective ways of doing fulfillment. If you adopt this when you are doing 10 orders/day, the system will grow with you to over 1,000 orders/day! Each person doing fulfillment should be able to average 45 orders/hour - including pick/pack and putting the label on the polymailer/putting it in an outgoing mail bin. If you are not at 45 orders/hour/person - then you can benefit from implementing fulfillment this way. Next, we want to go and create all the labels for these orders. The system can mass-create labels since we know the weight of all the packages based on the items that we know are inside! Note: CommentSold separates shipped orders from Local Pickup orders. You can simply click "Print Local Pickup" at this point to print out the pick/pack lists for your local pickup orders! Next, we will want to go and mass-create labels for our shipped orders. Simply click Create Labels and then select all the orders to generate shipping labels for by clicking the top checkbox and clicking "Calculate Prices"
After, you can see all your orders now have shipping labels! 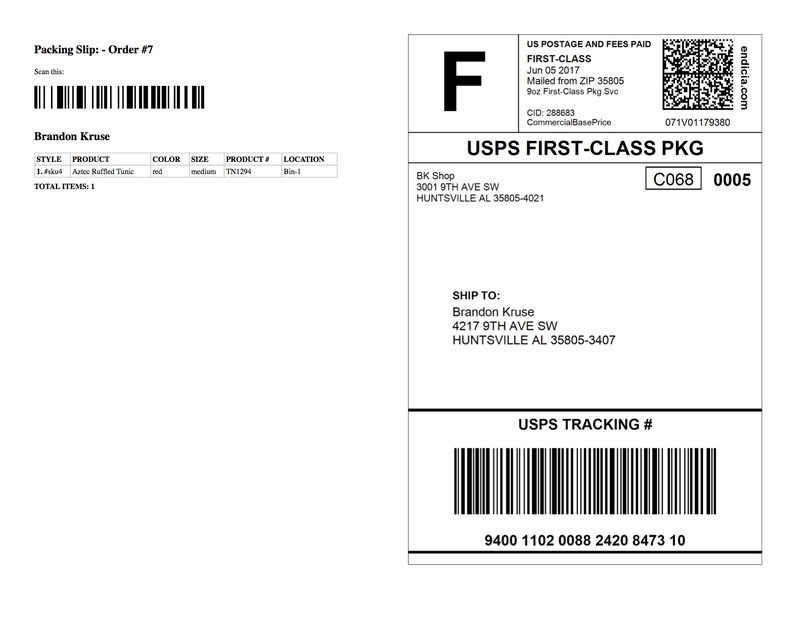 Go back to your orders page and click on the "Print Shipping Labels" button! You will now see all your orders and labels! This is setup to print on a normal paper printer with no special options. What you'll end up with is a pick/pack list on one side, and a shipping label on the other side! For local pickup orders, you'll have the pick/pack list and no shipping label. It may be hard to see, but the pick/pack list has the location of the items you entered in. It's very important to use these locations, as CommentSold will group orders together that have items in the same area of your warehouse! When you are finished printing, you can "Mark as printed" which will stop those labels from being printed another time in the future. As you can see on the packing slip, there is a barcode under the text: "Scan this:"
If you go to the orders page and scan the barcode, it will immediately pull up the order and log that you scanned it. We can even enable Strict Mode that will only allow you to fulfill an item if you properly scan all the barcodes of the items that are in the order! Now you can see who fulfilled the most packages on the reports page! It'll break down all your team members and how many packages they fulfilled, and how many items they fulfilled.